As a follow on from the previous post, another (related) way of converting a pitch CV signal to a frequency value is to offset any negative voltages, and then divide the pitch CV signal and then measure the voltage. In this case, a Teensy LC is used. 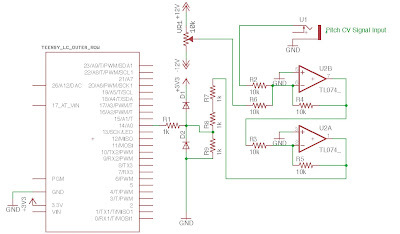 12V and -12V power supply rails are required. In this case, the Digilent PowerBrick supplies both from USB 5V. 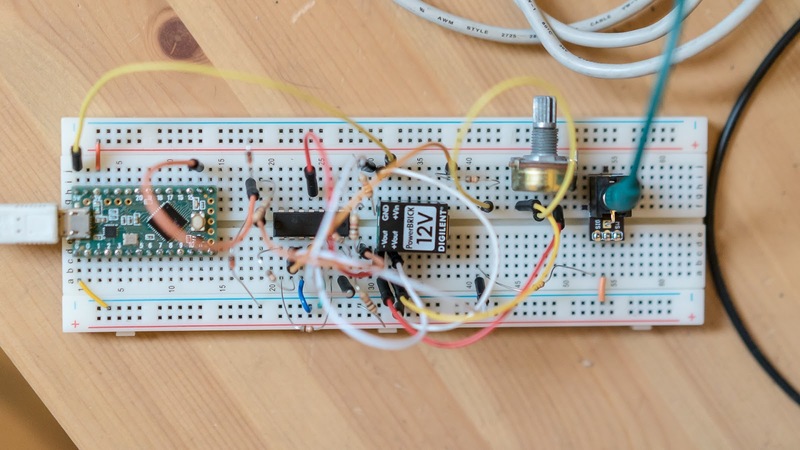 A Eurorack power supply could also deliver 12V and -12V. The pitch CV signal is summed with an offset voltage. The offset voltage is derived by dividing +12v to -12v with a 10k potentiometer. The sum of both signals is fed into an inverting opamp with unity gain, whose output is fed into a second inverting opamp. The resulting signal is a phase-correct unipolar pitch CV signal (assuming the 10k potentiometer is set correctly) in the range of perhaps 0V to 10V. This signal is then divided by 3 by using a resistor voltage divider, where 20k is on the input side and 10k goes to ground - this will then equate to 1/3V per octave. The output of this voltage divider is then fed through some clamping diodes (such as 1n4148), to limit the range to 0V - 3.3V. The voltage is then read as a 12-bit analog to digital value. 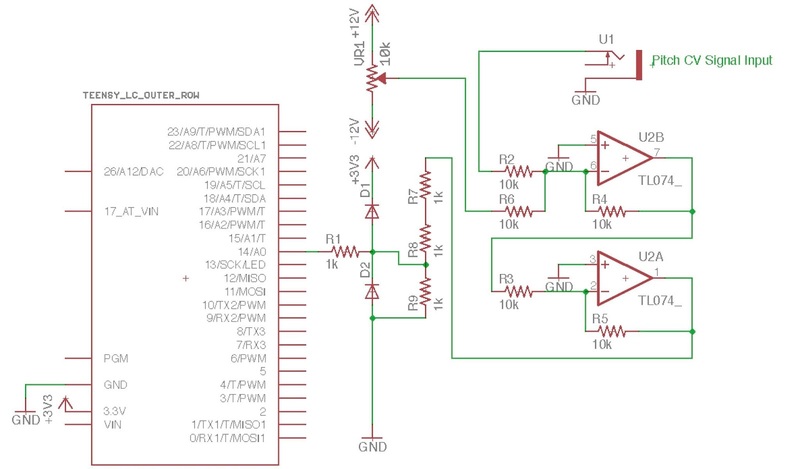 The value range of the ADC conversion is 0 - 4095, and this represents a voltage range of 0V - 3.3V, which in turn represents a pitch range of 0 to 9.9 octaves (at 1/3V per octave) with a resolution of about 2.9 cents. The ADC conversion value is mapped to MIDI pitch, giving a range of 120 - 132 semitones. This MIDI note value is then converted to frequency using my Arduino mtof library, which can be downloaded here. The frequency value could be used to control another synthesiser or oscillator, or used for analysis and further conversion. In this particular example, the resulting frequency value is sent via two MIDI pitch messages - one for the integer portion and one for the floating portion - and then reconstructed as a frequency value for a sine wave in a Max patch. A comparison can then be made to the analog output of a VCO to see how accurate the pitch conversion is. Note that a scaler value of 1.03 corrects for tuning issues - this value may change depending on setup. /*  To test out the frequency values that are being generated from pitch cv conversion, the frequency value is sent over MIDI pitch bend. *  The pitch bend messages are re-constituted in a Max patch for testing. *  This is because they used as a way of conveying the data and not as a regular pitch bend message.